I’m really sad to say this is based on several real conversations I’ve had, and it just blows my mind. I’ve had several grown people condescendingly tell me fantasy is childish and mythical creatures aren’t actually ever in books written for adults. In reality–say these people who know nothing about fantasy because they don’t read it–the presence of imaginary creatures actively MAKES the story juvenile, and adults who read these things are both Not Really Adults and Not Very Plentiful. I’m not even kidding when I say I’ve been told that I don’t know my audience. 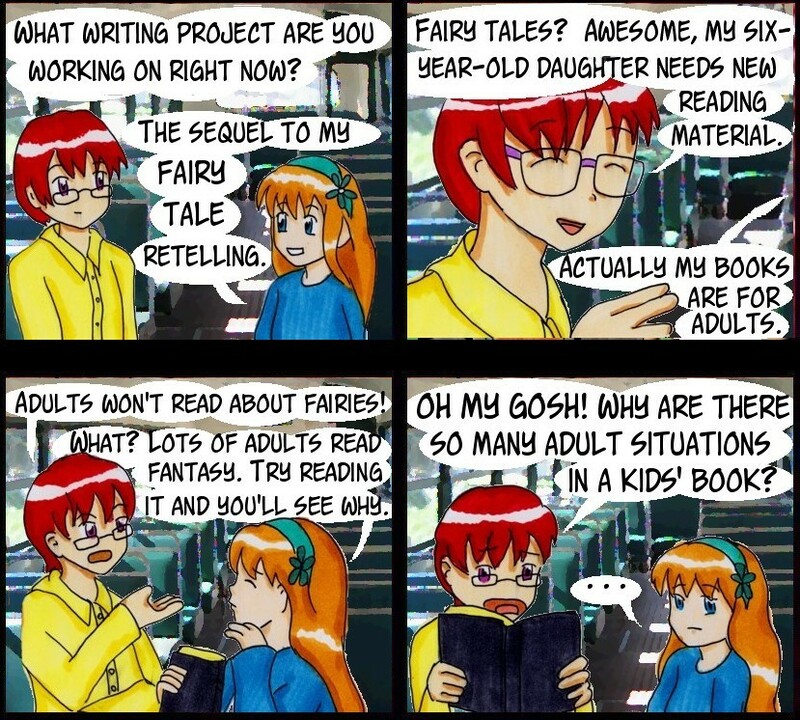 Because I actually think adults who would read about fairies exist in droves. I’ve seen the hundreds of thousands of reviews and excited discussions about fantastical stories, guys. Most of the buzz comes from grown-ups. Your kid would not. Like. This. Unless they like nightmares. Wait until they’re at least a little older until they pick up my stuff. It leans creepy. The fairies I write about aren’t all sweetness and light. . . .
What CS Lewis would call “men without chests” (ironically, men lose their humanity as they dominate nature). What Owen Barfield would call the “modern idolatry” – where modern people confuse their mental figurations (models constructed from sensory data) with “reality”, and aren’t even consciously aware of their own role in constructing the world they experience (whereas this awareness was common prior to the Enlightenment). Oh, come on! next, you’ll be telling me that the modern re-telling of Sleeping Beauty isn’t for kids. Mine spend hours locked in their room reading.